On 20 October 2017, about 60 delegates from 20 member and observer associations of EUROMIL came to Riga, Latvia for the 116th Presidium Meeting. 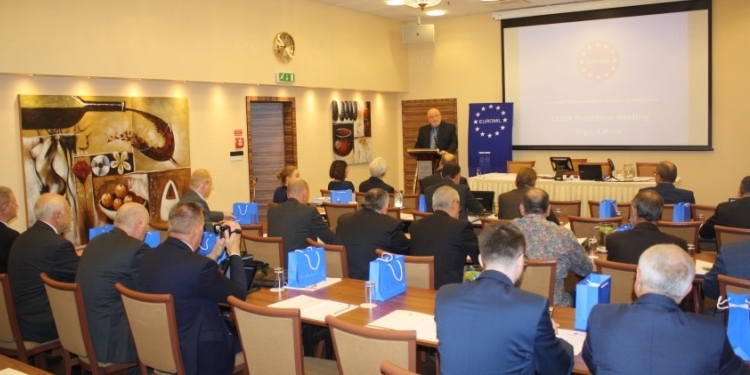 EUROMIL holds Presidium Meetings twice every year. The Presidium approves the policy of the Board and provides impetus for the prospective further development of EUROMIL policy. It decides on the accession of member associations and approves the budget. The President of EUROMIL, Emmanuel Jacob, welcomed the delegates in Riga to the first Presidium Meeting of EUROMIL in the Baltic states. (The full speech of the President is available on youtube). He went on to explain the geostrategic and political importance of the Baltic region for Europe. Furthermore, he highlighted that also EUROMIL is highly interested in extending its contacts in and with the Baltic states. Looking at the current situation. E. Jacob noted that security and defence are high on the European agenda these days. He pledged to not forget the social and human factor of European defence and reminded the participants about the SAFE project but also the recent European Parliament resolution on the European Defence Union in which the perspective of military personnel was included. In this context, he also expressed his dissatisfaction that the human dimension is so far not included in the efforts to formalize the Permanent Structured Cooperation (PESCO). Janis Baškers, the Chairman of LSA, took the floor and welcomed the participants on behalf of LSA and thanked EUROMIL for organising its 116th Presidium in Riga. He shared some insights about the history of LSA and its current projects, such as the support of national and patriotic education as well as increased pensions. Raimonds Bergmanis, the Minister of Defence of Latvia, expressed the view that the mission of EUROMIL is highly essential: In times were European armed forces increasingly work together, also those who defend the soldiers’ professional interests need to build up networks and increase cooperation. The Minister then went on to elaborate on the current challenges Latvia and the Baltic states in general face, such as psychological, cyber and hybrid warfare. In this regard, he especially highlighted the important role of the NATO Strategic Communications Centre of Excellence which operates in Riga since 2014. Minister Bergmanis went on to explain that Latvia will spend 2% of its GDP on defence in 2018, an increase in budget which he promises to use wisely. With regards to NATO, the EU but also EUROMIL, the Minister concluded that there lies a great power and strength in alliances and unity and that “social rights of soldiers must be at the forefront of our work”. Mr. Ojārs Ēriks Kalniņš, Member of the Latvian Parliament and Chairman of the Foreign Affairs Committee, shared his views on NATO’s enhanced forward presence in the Baltic states. When he welcomed the NATO troops, he felt “pride, hope and confidence” for Latvia to be member of such a powerful alliance which unanimously pledged to reassure the Baltic allies. With regards to the aim of NATO allies to spend 2% of their GDP on defence, he reflected that this might be misleading. In his opinion, capabilities and engagement are equally important as high defence spending. To underline this point, he took the example of the Canadian armed forces, which are leading NATO’s engagement in Latvia: Without spending 2% of their GDP on defence, the Canadians are ready to take the lead and contribute to the allied efforts whenever needed. Mr. Kalniņš furthermore expressed the hope that the geopolitical situation of his country and the European Union in general would change in the long term to the better. The President thanked the two speakers and asked the Minister to convey this obligation of states to care for their military personnel to his European colleagues. In the subsequent plenary debate, the delegates discussed how better information sharing and coordination could improve EUROMIL’s role especially with a view on multinational missions in which soldiers from different countries face the same problems. In the afternoon, delegates discussed internal reports. A common theme in all national reports were issues of recruitment and retention of military personnel – an issue which EUROMIL will focus on in the future. The Presidium also accepted the Bulgarian Armed Forces Women Association (BUAFWA) as an observer. EUROMIL counts now 34 member associations from 23 countries. The next Presidium Meeting will be held in April 2018 in Brussels, Belgium.